SpaceX’s Dragon is now through the opening stages of being berthed on the International Space Station (ISS), after the spacecraft was captured by the Space Station Remote Manipulator System (SSRMS) on Friday. The effort to fully install Dragon to the ISS will continue throughout the day, although the major elements of the historic milestone have now been completed. The first private spacecraft to visit the ISS had already completed the the C2 objectives of the combined C2/C3 mission by early Friday, already a great achievement for what is only Dragon’s second journey into space. Coming out of far field phasing, Dragon fly just over 10km under the ISS, a distance that allowed for a test of the UHF communication system between the orbital outpost and the commercial spacecraft via the Commercial Orbital Transportation Services (COTS) Ultra High Frequency (UHF) Communication Unit (CUCU). The test – also including checkouts of the Light Detection And Ranging (LIDAR) hardware and GPS – was a success, marked by the ISS crew managing to command a strobe light on the Dragon, showing they had the ability to communicate with the spacecraft. “SpaceX and ISS Communication check – COTS UHF Communications Unit (CUCU) bidirectional communication was established successfully at ~ 10.4 km range during SpaceX Dragon Fly Under demo was successful. The Crew performed Strobe light ON command via Crew Command Panel (CCP),” noted Status Update information via L2 – (LINK). 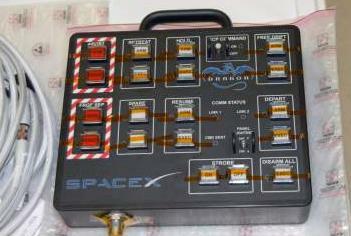 The ISS’ Space Integrated GPS/Inertial Navigation Unit (SIGI), one of two GPS units required for Dragon’s Relative GPS (RGPS) navigation, also worked without issue, following some late evaluations ahead of the mission to ensure the availability after requirements to Removed & Replace (R&R) one of the units after data showed the old unit was in a degraded state. A minor issue relating to the berthing attempt was observed on Thursday, as ISS crewmember Don Petitt called down to note one of the Robotic Work Station (RWS) monitors in the Cupola was failing to display information. Options existed to move to the Lab’s RWS for the berthing attempt, or replace one of the lab monitors in the Cupola. However, the monitor was fixed via troubleshooting. “Cupola Robotic Work Station (RWS) Monitor 1 Failure: After ground powered-up the Cupola RWS, crew entered the Cupola and found Monitor 1 to have no video or data, just some horizontal red and white lines near the middle of the screen indicating a sync problem. 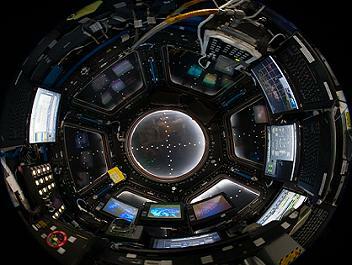 The crew cycled power via UOP1 in the Cupola and the monitor was recovered,” added the Status update. The Node 2 Nadir (N2N) Common Berthing Mechanism (CBM) Loss of Communication (LOC) Anomaly was also discussed. However, this was also recovered, deemed to be in an acceptable condition, resulting in the ISS being “ready to support SpaceX berthing”. For the next big milestone, berthing, Dragon was put through a series finite manuevers, mainly to ensure the safety of the orbital outpost – and its crew – as the vehicle enters the safety zone surrounding the Station. First up for Dragon was a repeat of the first part of Flight Day 3’s racetrack profile, as the spacecraft once again catches up to the Station via the Hight Adjustment (HA) and Co-Elliptical (CE) burn, bringing Dragon 2.5 km below ISS. 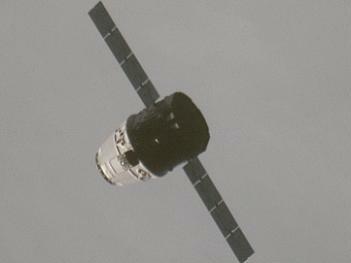 A Go/No-Go was then performed for the HA3/CE2 burn pair bringing Dragon to 1.2 km below ISS. The HA3/CE3 burn pair, using RGPS and configured with the ISS’ own GPS system, were then conducted, followed by the HA4 (Ai) burn, taking Dragon inside the corridor where the crew begins to monitor the spacecraft’s approach. With “Tally-Ho” on the Dragon for the second time in this mission – this time with its strobe light clearly visible – the spacecraft then into the business end of it’s rendezvous operations. This resulted in Dragon arriving – and holding at – 250 meters from the Station, where checks of Dragon’s LIDAR system were conducted, a key element of hardware that has a heritage of testing via the Space Shuttle Discovery during her STS-133 mission. A retreat was called to test the abort capability, prior to moving forward again to a 235m hold point. With hold and retreat demos being conducted, yet more Go/No Go polling were conducted by controllers at the Johnson Space Center (JSC) Flight Control Room (FCR) and at SpaceX’s Mission Control in California. Dragon was then commanded to 200 meters from Station, to allow for better data from the Thermal Imagers on the spacecraft. This was followed by another additional hold point of 150 meters, inside the “keep out sphere”. Next, Dragon was given a “Go” to approach to 30 meters distance from the Station where it will automatically hold. Controllers noted that the Thermal Imagers will continue to be evaluated during the approach. 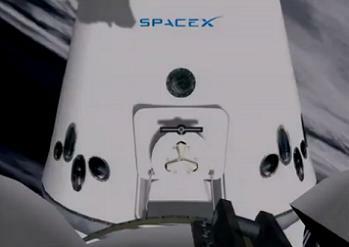 However, another hold was called – this time by SpaceX – in order to reconfigure the LIDAR system to a different mode. A retreat to 70 meters was then called by SpaceX, who are continuing to take a “close look” at the LIDAR data. The problem was deemed to be via “stray reflections” from the JAXA JEM module’s External Platform (EP) impacting on the LIDAR. The teams decided to narrow the view range of the LIDAR to remove the reflections from the field of view. This allowed for a “Go” is given to make the full trip to 30 meters from Station, ahead of Dragon entering the critical phase of approaching the ISS, proceeding from 30m to the Capture Point at 10 meters out, where Dragon automatically held. The ISS’ robotic assets – already translated to the pre-capture position – were then prepared to move towards the Dragon from the Cupola RWS. This came after the final Go/No Go poll was performed for Capture, as the crew is informed of the postive decision from the ground. Upon receiving the “Go for Capture” call from Houston, the ISS crew armed the SSRMS capture command and begin tracking the vehicle through the camera on the Latching End Effector (LEE) of the SSRMS, noted an overview presentation (L2 – Link). With the ISS’ thrusters inhibited and Dragon confirmed to be in free drift, the arm’s LEE will be maneuvered over the Grapple Fixture (GF) pin on Dragon to trigger the capture sequence ahead of pre-berthing maneuvers. With the addition of several holds into the timeline, capture was confirmed later than expected, at 13:56 GMT. 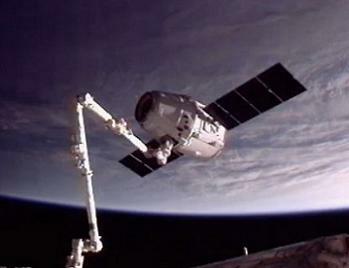 The Dragon, now secured by the SSRMS, was carefully translated to the pre-install set-up position, 3.5 meters away from the Station’s module, allowing the crew to take camcorder footage of the vehicle through the Node 2 windows. This footage will then be downlinked to the ground for engineers to evaluate the condition of the Dragon spacecraft. 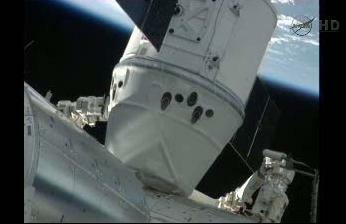 The SSRMS was then maneuvered Dragon to the second pre-install position, at a distance of 1.5 meters out. Desats were inhibited prior to the maneuver of the Dragon into Common Berthing Module (CBM) interface to begin the securing of the spacecraft to the ISS. A “Go” at this point was marked by all four Ready To Latch (RTL) indicators providing confirmation on the RWS panel. As has been seen with other arrivals – and indeed new additions to the Station itself – Dragon was then put through first stage capture tasks, allowing the SSRMS to go limp, ahead of second stage capture, officially marking Dragon’s berthing with the ISS at 11:02 Central Time. With the SSRMS now keeping hold of Dragon through most of the mission – per NASA’s coverage “as a precaution” – there remains one major robotic operation to come ahead of unberthing. This will begin on Sunday, when the SSRMS is set to pick up the Special Purpose Dexterous Manipulator (SPDM) – otherwise known as Dextre – allowing it to greet the new member of the ISS resupply family. The plan involving Dextre is related to performing a survey of the Dragon trunk using SPDM at the end of the SSRMS, after the big arm retrieves its Canadian cousin from the Mobile Base System at Work Station 5 (WS5). 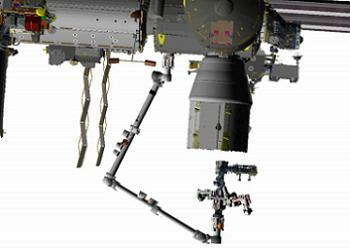 Dragon’s trunk – per the plan – is to be surveyed using Dextre’s own LEE and Camera Light Pan Tilt Assembly (CLPAs), under the control of MCC-Houston. This task is to allow for teams on the ground to assess viewing and lighting conditions to aid in operations planning for future trunk cargo extraction/insertion operations that will play a resupply role during future missions. Once the survey has been completed, per the plan, the SSRMS will return Dextre to the MBS, which will then carry the robot back to Work Station 2 (WS2). According to NASA PAO in response to NASASpaceflight.com, this robotic operation will begin at 4pm Central time, under the control of ground teams. Meanwhile, the Dragon has successfully been ingressed early on Saturday, following leak checks and hatch opening. This marks the official start of cargo operations, removing Dragon’s manifested items and preparing to load Dragon up with a quality of downmass to return to Earth. This article will be updated throughout the major events. (Images: NASA, CSA, SpaceX and via L2’s SpaceX Dragon C2+ Mission Special Section – Containing presentations, videos, images, interactive high level updates and more, with additional images via NASA, SpaceX).